Posted in Brunch, Healthy, on December 13th, 2013. You might think you don’t need a recipe for a fruit salad, right? 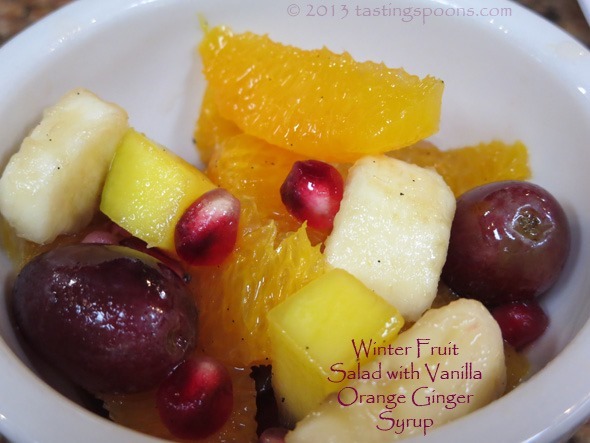 But if you’d like to serve a fruit salad that’s just a bit different, you could try this one. You just have to plan ahead a few hours or overnight (to make the flavorful syrup) to serve this with a brunch. It’s well worth making. Ginger seems to be on my radar lately. And if I were to just add a vanilla bean to the stem ginger in syrup that I made last week, I’d have had half of this recipe already done! In this case you make a simple syrup with fresh ginger, a vanilla bean and a bunch of lemon peel. That does need to be made ahead as it provides a ton of flavor to the fruit once you mix it all together. Once that mixture has cooled and the solid stuff (ginger, vanilla bean and lemon peels) strained out, you’re left with this delicious ginger/vanilla essence syrup. You could just slurp it with a spoon. Trust me on that one! (If you have leftovers of the syrup, it would be lovely added to a cup of hot tea.) But we’re making a fruit salad, so all you do is add in all the fruit. You could change what YOU like to have in the way of fruit – at the class Phillis Carey used Navel oranges, mangoes, bananas, kiwis, grapes and pomegranate seeds. It was a beautiful and very tasty combination. You could add apples, pears or pineapple too. Your choice. What’s GOOD: the flavoring in the syrup is what makes this. The ginger gives the syrup just a teeny tiny bit of heat and the vanilla adds a depth to it – perhaps not distinguishable, but it makes for one very tasty bowl of fruit. The pomegranate seeds add a lovely color to the presentation too. What’s NOT: really nothing except that you do have to plan ahead one day or at least half a day to make this. 1. Combine the sugar, water, the ginger and vanilla seeds and pod in a saucepan. Use a vegetable peeler to remove wide strips of zest from the lemon and 1 orange, add to the saucepan and bring to a boil over medium-high heat. Reduce the heat and simmer 5 minutes. Refrigerate until cold. 2. Meanwhile, peel the remaining oranges with a paring knife, cutting along the natural curve of the fruit. Hold an orange over a large bowl and cut along both sides of each membrane to free the segments, letting them fall into the bowl. Also segment the orange used in the syrup that’s already peeled. Squeeze each empty membrane to release the juices. Repeat with the remaining oranges. Add the mangoes, kiwis and pomegranate seeds and gently toss. Pour the syrup over the fruit and chill overnight. 3. Before serving, remove the citrus zest, ginger and vanilla pod. Add the fresh banana at this point. Pour into a large serving bowl or spoon the fruit and syrup into individual bowls. 4. POMEGRANATES: To remove pomegranate seeds, cut the fruit into quarters, then break apart in a bowl of water. Skim off the pith that floats to the top and drain the seeds. Per Serving: 158 Calories; 1g Fat (2.9% calories from fat); 2g Protein; 41g Carbohydrate; 4g Dietary Fiber; 0mg Cholesterol; 6mg Sodium. Posted in Chicken, Healthy, on November 7th, 2013. 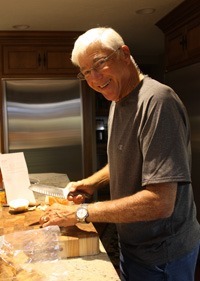 Remember, I told you we’d be fixing that chicken dish – the one that my hubby made for me on about our 3rd or 4th date, way back 32 years ago? Here it is . 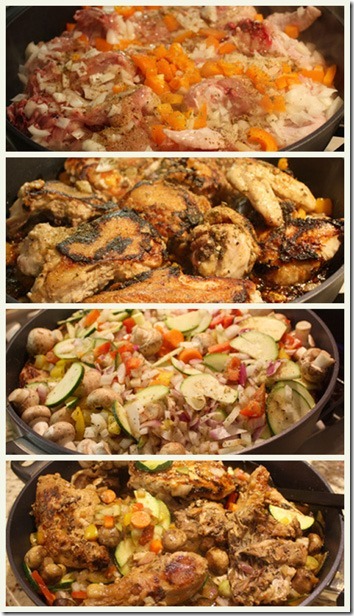 . . you make it all in one pan (except for a carb if you choose to make one). It’s incredibly easy. If you didn’t read my post a few days ago about my hubby Dave’s favorites, you won’t have the back story on this dish. Go read that if you care to. Here’s a bit more of the background. In 1981, Dave and his son lived about a block or two from our local fairgrounds, and often on Saturdays they’d go over to the weekly swap meet there (that still goes on at that location). Dave remembers vividly one Saturday as they walked up and down the rows, that he could smell something wonderful. Finally they came to a stand where a couple of Aussie guys were making chicken. It was only about 9:30 in the morning, and both Dave and his son gobbled down a sample of this dish, and Dave promptly bought a set of seasonings from this company, Benson’s Gourmet Seasonings. The company is still in business, and this recipe – the same one they were fixing at the swap meet in 1981, is still the one they demonstrate, and is their #1 selling mixture. It uses their Supreme Garlic and Herb Salt Free Seasoning 2 oz Bottle – the link here is to Amazon, and they carry the whole line, if you’re interested. Dave made this dish for me, back in 1981 right after I met him, and he made it at least one other time, and the bottles of seasoning mixes have sat dormant on my pantry shelf ever since. Not in the regular place, but Dave didn’t want to throw them away – when we moved to this house 10 years ago I was going to toss them out. You know, herb and spice mixtures lose all their potency after a few weeks or at most a month. But Dave said, no, don’t throw them out. So they sat in an obscure and out of the way space. I generally don’t use those pre-packed seasoning mixes just because I know they don’t retain flavor well. I like to make my own combos at the moment when I need them. The only one I’ve been known to make in quantity is the North African Grilled Corn on the Cob spice mix. I make up a batch at the beginning of corn season and try to use it up by the time corn season has passed. Having laughed over the chicken dinner story the other day, I dug out the bottle (that is 32 years old), went online, not expecting to find anything, and found the company’s website and their recipe easily enough. And decided that Dave needed to renew his acquaintance with this dish. Here he is at our kitchen island. I cut up a whole chicken for him (next time we will make it with just chicken thighs, I think – much easier). I set him there at the cutting board with all of the vegetables he needed to chop. A lot. First you must have half a chopped onion and half a bell pepper. This dish takes 60 minutes to make, hence you want to start with medium-low heat. The herb mixture is added in at 3 junctures in the process. The pictures here show the progression of the dish. First you put the raw chicken pieces in there (no seasonings, no oil, nothing) in a big honkin’ pan (we used a 12-inch nonstick pan with 4” high sides) skin side down with the heat at medium-low. The first set of veggies are added on top and down in any crevices you can find. In the 2nd picture, after 20 minutes, you turn the chicken over. See, nicely browned chicken pieces. Then after another 20 minutes of browning you add all the vegetables (more onion, peppers, zucchini, carrots, celery and mushrooms). The veggies kind of sit there on top and you wonder if they’ll ever cook through. Ten minutes later you stir it all up (you do that several times so the veggies will get done). You never add a lid. But you do add 1/2 cup of white wine (we used vermouth) during the last 10 minutes and continue cooking until the chicken is done and the veggies are cooked. Actually, we removed the chicken pieces to a hot plate and very briefly cooked the veggies for about 2 minutes – there were a few pieces of carrot and zucchini that weren’t quite done. Meanwhile, make some rice. We made pasta (Dave’s choice), but I really think it would be easier to eat and more tasty with rice. Your choice, of course. I made linguine and thought it was too difficult to handle. There is NO SALT in this dish. There is NO FAT added to this dish. And it’s delicious. Because the spice mixture was SO old, I measured out double the amount of it (so 2 T. rather than just 1). I think I need to order a new bottle, although the seasoning did have some smell and taste. What’s GOOD: it’s a make-in-one-pot kind of dinner (except for a carb if you choose to make one). There’s lots of good flavor in it. It’s easy, really, but you do need to do a bunch of veggie chopping and prepping. Makes a big batch – I think it might feed more than 4 if you have a larger chicken. We had a 4-pound one and will likely get 3 meals out of it. It’s a pretty dish – lots of color. We don’t like green bell pepper, but it would have added even more color to the pan. The wine makes a kind of juicy sauce (unthickened, of course) – scoop some of it out with each serving onto the carb. Love that this has not one speck of added salt or added oil. You won’t miss it – really. What’s NOT: just the time you need to spend tending to this – not hard – but you don’t want to go off and leave this as it requires a lot of chopping at first, then mixing around during the last 20 minutes. The chicken breasts were a little overdone, we thought, so I’d probably add them later or remove them early. 1. Preheat a 12-inch non-stick skillet over medium-low heat. Place chicken skin side down. Use no oil. 2. Put about 1/2 of a chopped onion & 1/2 of a bell pepper sliced, in spaces. Sprinkle all with 1 tsp. seasoning. and brown over medium-low heat for about 20 minutes. 3. Turn chicken pieces over and sprinkle with 1 tsp. seasoning. Brown another 20 minutes. 4. Add all remaining vegetables. Sprinkle with remaining 1 tsp. seasoning. Stir occasionally so vegetables cook evenly. Cook about 20 minutes longer. Do not cover. Add wine (liquid) the last 10 minutes. Serve with or over rice, noodles or pasta, or just as it is. (If by chance the vegetables aren’t quite done, remove the chicken to a hot serving plate, cover with foil and turn up the heat under the vegetables and cook until they’re all cooked through.) The nutrition count on this assumes you eat all the skin. Per Serving (this assumes you eat all the skin): 519 Calories; 30g Fat (53.4% calories from fat); 40g Protein; 18g Carbohydrate; 5g Dietary Fiber; 176mg Cholesterol; 162mg Sodium. Posted in easy, Healthy, Soups, on September 29th, 2013. 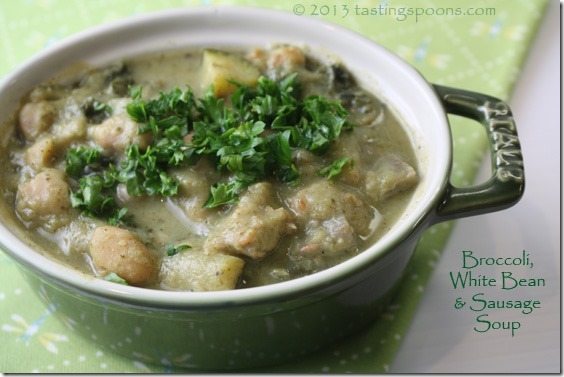 Hearty, comforting and healthy soup. There’s no cream in it – the broccoli provides the creamy texture. I know that sounds strange, but it’s true. Read on . . . Rarely do I watch The Chew. The show is so fast-paced (frantic almost, like The View which I refuse to watch at all because they all talk over each other) and loud that I will only watch it on occasion and rarely do I ever try one of the recipes. A few over the years . . . but I know the show is well liked by many. When we were on our trip I happened to turn on TV and I tuned in to the program and Stacy London [a TV fashionista and co-host of the show What Not to Wear, another show I don’t watch] was making a soup. She had someone come to her home to cook for her and this recipe was borne of that professional relationship, as I understood it. Apparently, she had leftovers of both a healthy pureed broccoli soup and one with white beans and sausage and Stacy decided to combine the two. She loves it so much that she learned to make it herself and eats it by the gallon. It’s no secret around here that I love soups. Not only for their ease (a meal in one pot) but soups are comforting and provide infinite variety. And often I add a little jot of cream to soups. This soup looked like it had cream in it, but it doesn’t. Nary a bit of cream or dairy at all. Basically you make 2 soups – a broccoli soup in one pot (which gets pureed and becomes the liquid in the other soup) and the spicy sausage and cannellini bean soup in the other. Once the broccoli soup is cooked through (takes no time at all) it’s whizzed up in the blender and then that’s added to the other. Because I had some mushrooms on hand, I added them, and I think I added some zucchini too, though neither of those were in the recipe. The only fat in the entire soup is a tablespoon or two of olive oil to sauté the onions, the same for the chicken sausage soup plus whatever intrinsic fat is in chicken broth and the chicken sausage (not much, in other words). Adapting the recipe a little, I added some fresh mushrooms and zucchini to the soup. Why not, I said? I wanted more veggies and texture since the broccoli is completely pureed. The recipes serves 8, and that’s about right – we had 2 dinners and 2 or 3 lunches out of the one preparation. I’m sure it would freeze well also. What’s GOOD: I like that it’s a very healthy soup. I really had to work at it to taste the broccoli (and I like broccoli) since it’s pureed. You honestly think it’s a cream soup! My DH liked it a lot and told me each time I served it that it was really good. I felt the same way. A keeper. It’s not gourmet. It’s not over-the-top with flavor, but it’s just wholesome and good. It’s thick – you can see that from the photo. If you wanted a lighter soup, add more chicken broth and thin it some. What’s NOT: nothing at all that I can think of. 1. Place a heavy bottomed pot over medium-high heat. Add 2 to 3 tablespoons of olive oil and then add onion. Season with salt and pepper and cook for 3 to 5 minutes, or until just translucent. Add the broccoli and again season with salt and pepper. 2. Pour the chicken stock over the broccoli and bring up to a boil and then reduce to a simmer. Cook for 8 to 10 minutes, or until the broccoli is fork tender. 3. Let cool slightly and then transfer, working in batches, to a blender. Cover the blender with a towel to ensure it doesn’t splatter, and puree until VERY smooth. Taste and adjust seasoning. 4. Place another heavy bottomed pot over medium high heat and add 1 to 2 tablespoons of olive oil. Add the sausage and brown on all sides, about 8 to 10 minutes. 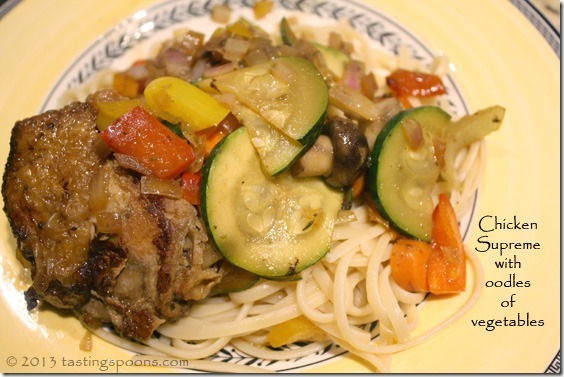 Add mushrooms and zucchini and continue cooking for 5-7 minutes. 5. When almost completely cooked, add the kale. Season with salt and pepper and cook for 3 to 4 minutes or until the veggies are all cooked sufficiently. Add the beans and cook for another 1 to 2 minutes. 6. Pour the broccoli soup in the sausage and kale and stir to combine. Let cook for one to two more minutes to let the flavors meld. Taste and adjust the seasoning, then serve while hot. Garnish with chopped parsley, if desired. Per Serving: 401 Calories; 12g Fat (25.3% calories from fat); 35g Protein; 42g Carbohydrate; 16g Dietary Fiber; 53mg Cholesterol; 1450mg Sodium. Posted in Healthy, Salad Dressings, Salads, on February 4th, 2013. 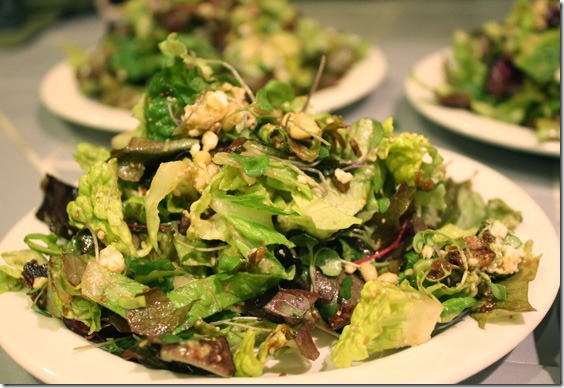 A luscious salad – different – healthy, really – because it doesn’t have all that much oil in it – hard to believe it could taste so good! Dried figs give it a base, and you do add some crumbled bacon. Having been asked to bring a salad to dinner at friends recently, I ransacked my to-try file, to find something that would complement Thomas Keller’s Roast Chicken and Vegetables, which my friend Donna was going to make. Donna reads my blog (thank you, Donna!) and is always so kind to tell me how much she likes it. Music to any blogger’s ears, I’ll tell ya! just a minute in the balsamic vinegar and allowed to “steep” or sit while you pull together the rest of the ingredients. Then it’s all whizzed up in the blender. Meanwhile, I chopped up and fried a bunch of bacon. 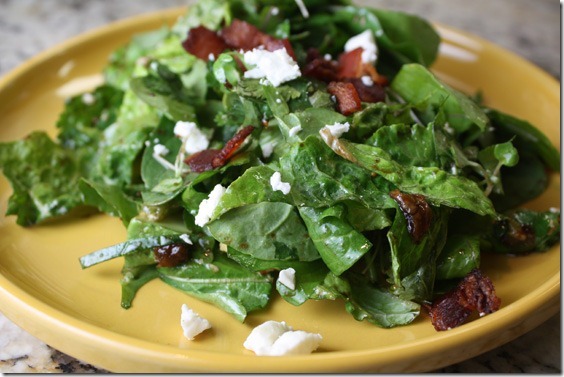 I made this salad twice, on consecutive nights, and used different greens. I couldn’t find arugula the first day, so I substituted Romaine, leaf lettuce and microgreens. I actually think the salad needs some bitter greens to offset the fig-sweetened dressing, so the second time my DH was able to find arugula and I used Feta cheese that time, rather than the cotija I’d tried the first time. The original recipe (from Cooking Light) called for goat cheese, but I didn’t have any. Nor did I really want to buy a log of goat cheese when I only needed a little bit for the salad. I almost always have Feta on hand, which keeps soaking in brine for many, many weeks. I did have cotija (it’s a dry, salty Mexican cheese that’s used mostly for garnish), so I used that one time. The second night (pictured above) I had arugula, but not quite enough dressing, so I just added more EVOO and another little jot of balsamic vinegar to what I had left from the previous night, and it was plenty for a salad for 4. What’s good: the low-calorie, low-fat aspect of the dressing. Of course, bacon kind of puts it over the top, but once you divide it among several people, no one has all that much bacon. I added pine nuts one night just because I thought the salad needed some kind of crunch to it. Since it doesn’t have any added vegetables, I really did think it needed some added texture. What’s not: nothing at all – just know this isn’t any standard kind of vinaigrette – it’s sweet from the figs, but will complement lots of meals – pork for sure – often pork is accompanied by fruit. NOTES: Use other lettuces if preferred, but use sturdy ones like Romaine, not tender leaf lettuces which won’t stay firm with the dressing. 1. 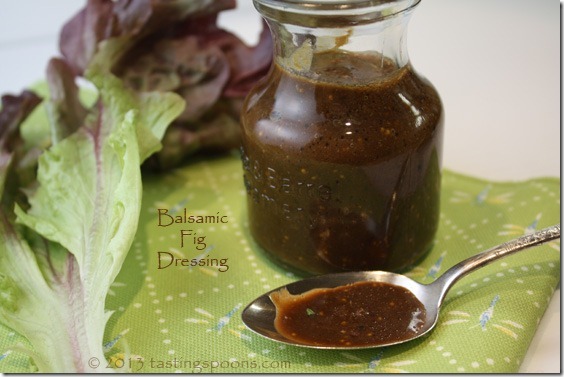 To prepare dressing, combine balsamic vinegar and figs in a small saucepan over medium-high heat; bring to a boil. Cover, remove from heat, and let stand 15 minutes. Combine vinegar mixture, 3 tablespoons water, and next 5 ingredients (through thyme) in a blender; process until smooth. Dressing will keep for several days. 2. To prepare salad, mix arugula with onion and toss with dressing. Taste for seasonings. Divide evenly among plates. Sprinkle with bacon, cheese and nuts. Serve immediately. Per Serving: 114 Calories; 8g Fat (58.6% calories from fat); 3g Protein; 10g Carbohydrate; 2g Dietary Fiber; 5mg Cholesterol; 109mg Sodium. Posted in Healthy, Pasta, Veggies/sides, on November 4th, 2012. Asian yam. I’m sure I have some readers who, after just seeing that word tofu – will not even read further. I might have been one of those some years ago. I don’t eat tofu, as tofu, but if it’s in other things, well, yes I do. 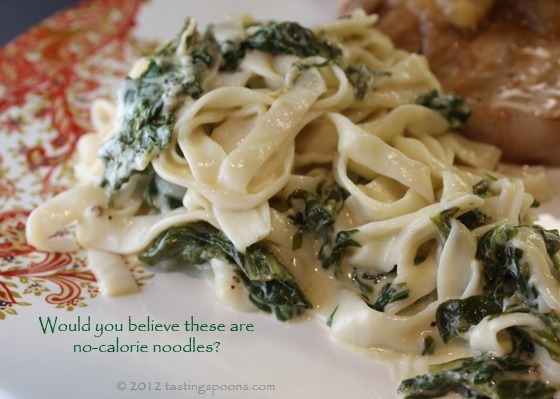 These noodles have almost zero calories, nearly zero carbs, zero fat in a single serving. It’s not news on this blog that we are a family of two try to limit carbs, what with my Type 1 diabetic husband. And certainly I can cut down on them myself. But I’ll tell you true – I miss pasta. Once in awhile – a big splurge for us – I make a huge batch of spaghetti sauce from one of my numerous recipes (my favorite one this year is Ina Garten’s Weeknight Bolognese Sauce). I freeze some of it for other dinner splurges months hence. Well, we’re now going to be able to have all we want because of these fantastic new products. I’d heard about them several months ago when I got an email from one of the daily deal emails I subscribe to, offering me “Miracle Noodles” for some unbelievably low cost. I knew nothing whatsoever about them. I talked to a friend of mine, a recent Type 2 diabetic, who is struggling with her revised diet, to ask if she’d like to share the box with me. It was 29 packages or some odd number. She said no. Knowing so little, I opted not to buy it, either. Then I visited a local Asian market, thinking that surely they would have them – indeed they did, although it wasn’t the “Miracle” noodle, but Tofu Shirataki (the fettucine and angel hair varieties shown here), and it took the store manager’s involvement to find them in the store. Aha! In the refrigerated area – not really near anything in particular – and they were lying flat, so you couldn’t see the package front very well. FYI: a 4-ounce serving (half of the above package) contains 20 calories, .5 grams of fat, 15 mg of sodium and 3 g of carbs. And 1 g of fiber. As I’m writing this, I haven’t had the Miracle Noodle yet – I’ll probably write up another post after that with more info. Each package holds about 8 ounces including the fluid – and about 4 ounces of net wet noodles – enough for 2 side servings. And just maybe enough for a small serving of a pasta main dish. These packages need to be refrigerated and they’ll keep for about 6 months. They don’t ever spoil, really, but eventually, the noodle may dissolve into its primary form of glucomannen (that’s the tofu and yam product). I threw together a side dish to serve them the first time. I had no recipe, but wanted to make it a little special for the first time we’d eat them since I wasn’t certain my DH would eat them – he did and he liked them. He loves pasta too, and encourages me to NOT make it very often since it wreaks havoc with his blood sugar. The thing you need to remember is that these noodles, like most tofu products, don’t have much taste straight out of the package, so you must add flavorful ingredients to them, so they’ll soak up the flavor. Don’t just heat them with a little oil or butter and expect them to have great flavor. They won’t. The other thing about these noodles is that they’re packed in a rather unappetizing fluid (that you drain off). It smells something like Asian fish sauce. In case you haven’t ever taken a sniff of Asian fish sauce, well, it’s not pleasant – kind of like rotten fish, actually. Tastes great, but doesn’t smell all that nice. So, there is a process of getting the noodles ready to eat. First, drain them, then rinse well under running water. According to the package instructions, I put them on a plate and microwaved them for 60 seconds. You can also “cook” them in a nonstick pan until they make a kind of squeaky sound in the pan, but microwaving is almost easier. I rinsed them again, drained again, then they went into the skillet. They’re already cooked, you see, so they don’t really need further cooking – just heating – but they need to absorb flavor. So I stirred them around, added the dairy stuff, some herbs and cayenne, and let them sit in the pan just barely simmering. I had to add a little water as the creamy ingredients boiled away, tasted it for salt and pepper, added the grated cheese and served it piping hot. What I liked: the fact that they’re very similar – not identical – to a wheat noodle, but have so few calories and carbs. That’s the logical answer, of course. Why would we bother to eat these unless they were giving us some kind of nutritional boon. Or if I needed to restrict gluten. Obviously these are GF also. What I didn’t like: if you forced me to say something negative (I’m trying to be at least neutral or unbiased), the texture of these noodles aren’t the same as a wheat pasta fettuccine noodle. It doesn’t have the same kind of “chew” as a wheat noodle – more like a rice noodle to me. But if you know going into it that you’re wanting a vehicle for the SAUCE – it’s the sauce we love, right? – then these noodles absolutely work. All in all, this is a great alternative to a much higher calorie wheat noodle. Recipe By: My own concoction. 1. TOFU SHIRATAKI PREPARATION: Remove noodles from package and drain. Run under water for 30-40 seconds, lifting and separating. Place noodles on a plate and microwave for about one minute (this parboils them). Remove from microwave and wash under running water again. Drain. 2. Meanwhile, in a large skillet (large enough to hold all of the mixture) melt the butter. Add arugula and spinach and stir over medium heat until greens are cooked. Add tofu shirataki noodles and stir to combine. 3. Add the sour cream, cream, goat cheese, herbs and cayenne. Stir to combine and continue heating over low heat. Add shredded Parm, salt and pepper to taste and add water to the pan if it’s thicker than you want. Serve immediately. Makes enough for a side dish, not a main dish. Per Serving: 193 Calories; 16g Fat (66.2% calories from fat); 13g Protein; 6g Carbohydrate; 3g Dietary Fiber; 44mg Cholesterol; 432mg Sodium. Posted in Desserts, Healthy, on August 5th, 2012. The title is a little bit of a misnomer – it really should be something like Buttermilk Peach Sorbet, or Buttermilk Peach Ice or maybe Peach Sherbet. Not a name with “cream” in the title since there isn’t any cream in it. But we lump all kinds of these frozen confections under “ice cream” whether they’re made with cream or milk or whatever. If peaches are still in season around your home, do make an effort to go get some gorgeously ripe peaches, peel them and briefly cook them in a little water, then freeze packets of it. You can then make summery ice cream any month of the year. I just hate to take up valuable freezer space with frozen peaches. My freezer is something of a problem – it’s FULL. And I mean FULL. I could probably get a few frozen chicken breasts in there, and maybe a few very flat things. But that’s about it. I am trying, really I am – to defrost and eat things out of the freezer but then I find some new thing that has to go in there. If I had a full-on stand-alone freezer in the garage it would probably be full too. I need a 12-step program for me and my freezer problem. Want to start one? Anyway, back to this dessert. The recipe came from Rick Rodgers. I’ve had it for several years, I think, but hadn’t gotten around to making it. But with peaches on the kitchen counter, well, this is what I did with them. I DO want you to read the nutritional info about this recipe – it’s really super low calorie and has a TRACE of fat in a serving. Is that great, or what? If you’re expecting this to taste rich and creamy like Häagen–Dazs, it won’t be. It’s more like ice milk. I think you need to be “of a certain age” to remember ice milk. My mother used to buy it all the time (this would have been the 1950’s) when I was growing up, but I don’t think I’ve seen it in years. I read online that it went “out” in the 1960’s when low-fat milk was produced. My dad had a passion for ice cream in any way, shape or form. In his 80’s he had to start eating sugar-free, but he still loved it. We all kidded him because after eating a small bowl (my mother would never serve a big bowl of it) he’d systematically scrape his spoon up the sides, from the bottom center and up, all the way around, until he’d made a full circle. My dad was an engineer, so we’re not talkin’ a few scrapes, I mean maybe 20-30 per bowl. To get every single, solitary, last drop. If there’s a gene for ice cream, I’ve at least inherited some of his passion for the stuff. I try not to indulge, but I do. This recipe makes it a heck of a lot better for me/us. Wanting to make this particular one more eating-friendly for my diabetic hubby, I made it with half Splenda. I DID use the 1/2 cup of brown sugar, though, in the mixture, because brown sugar has a unique caramel-like taste and I’d never thought about using brown sugar with peaches. It’s a match made in heaven, I’m telling you! It’s a simple recipe to make – don’t forget to add the almond extract – that’s also a little bit different, and I loved the taste of it. It’s not overpowering but just adds another layer of flavor. The recipe indicates you can make this without an ice cream machine. I did use mine, and when it first came out it was soft in texture, but once frozen for a few hours it was almost rock hard. So my only suggestion about this recipe is: let it sit out for about 20+ minutes before trying to scoop it. That’s what I had to do to get the photo up top. If you’re willing to eat a more icy type “ice cream,” and want the low in fat and calorie type, this may be a new favorite for you. Given the choice of this and full fat, well, of course the full-fat has better flavor, but if you want to cut back, give this one a try. What I liked: the brown sugar and almond extract add great layers of flavor in this. Just don’t expect it to be soft, scoop-able like ice cream – it’s more icy or sherbet-like. We loved it. Next time I am going to add 2 T. of Peach Pucker Schnapps to the mixture (any alcohol added to home made ice cream helps with the scooping ability), not only for the softness aspect of it, but also to add even more flavor (although it doesn’t really need it – it’s full of peachy flavor as it is). What I didn’t like: having to let it defrost for 20+ minutes is a bit of a nuisance, that’s all. Otherwise, nothing. 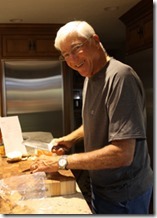 NOTES: Can be done without an ice cream machine – freeze a 9 x 13-inch metal baking pan. 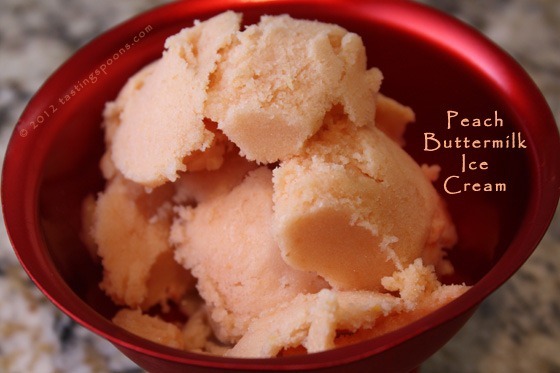 An ice cream maker gives the best results, but you can make it in the freezer if you wish. (The texture will be somewhat gritty, but it will taste fine.) The Schnapps in the recipe isn’t really needed – but next time I make this I’ll put it in because it may help with the scooping – once this freezes solid it’s rock hard. 1. Bring a large pot of water to a boil over high heat. Add the peaches and cook just until the skins loosen, about 1 minute. (If the skins are stubborn, the peaches aren’t as ripe as you thought, so remove them and pare off the skin with a sharp knife.) Using a slotted spoon, transfer to a large bowl of iced water and let stand until cool enough to handle. Discard the skin and pits and coarsely chop the peaches. Transfer to a food processor. 2. Add the sugar, brown sugar, lemon juice, vanilla, the almond extract and purée. (If using Peach Pucker Schnapps, add that into the bowl too.) Transfer to a large bowl. Stir in the buttermilk. 3. Transfer to the container of an ice machine and process according to the manufacturer’s directions. Pack the ice cream into an airtight container, cover and freeze for at least 2 hours to allow the ice cream to ripen and harden before serving. Leave out at room temp for about 20+ minutes to get it soft enough to scoop, as it freezes rock hard. Per Serving: 131 Calories; trace Fat (3.2% calories from fat); 2g Protein; 31g Carbohydrate; 1g Dietary Fiber; 2mg Cholesterol; 56mg Sodium.